Modular, pure and simple design with sophisticated technology. For the first time, the Nespresso expertise in sourcing the highest quality coffees and delivering an exceptional coffee experience is combined with KitchenAid's reputation for quality appliances. The timeless and premium metal design, together with the advanced and intuitive technology, provides the incomparable Nespresso experience. 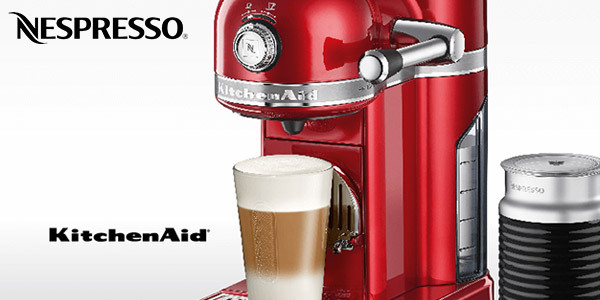 For the first time, two well-loved and iconic brands, Nespresso and KitchenAid, bring together their expertise in exceptional coffee experiences and quality appliances to design a machine to delight all coffee lovers. 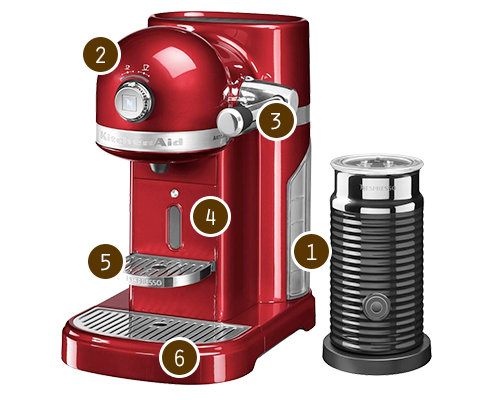 KitchenAid's iconic design and enduring quality adds to the Nespresso coffee experience with six pre-programmed cup sizes to suit your tastes. The timeless and premium metal design together with advanced and intuitive technology provides the incomparable Nespresso experience. The 19 bar high-performance pump is the key to perfectly extracting the delicate flavour and premium aromas of each coffee capsule during the brewing process and creating an incomparably dense and unctuous crema. The fast heat-up system reaches the ideal temperature in just 25 seconds, while the energy saving function automatically switches off the machine after nine minutes of inactivity (programmable). Nespresso by KitchenAid coffee machine offers an exceptional combination of an iconic silhouette, high quality materials and an array of functions to help you easily prepare your favourite Grand Cru coffees. These two well-loved brands bring together their expertise in exceptional coffee experiences and high quality appliances to create a machine to delight coffee lovers. 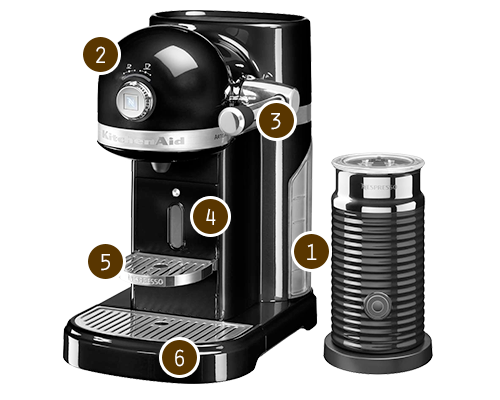 The central brewing button and selection dial easily allows you to select the cup size you prefer and activate the coffee, chose form six pre-programmed sizes from ristretto to lungo (25, 40, 60, 90, 110 or 130 ml). The coffee machine reaches the ideal temperature in 25 seconds while the energy saving function will automatically switch off the machine after nine minutes of inactivity. Made from sturdy die-cast metal it echoes KitchenAid's iconic design, the machine is simple to clean, keeping maintenance to a minimum. With a descaling program ready to work at the touch of a button, you can keep it in optimum working order. 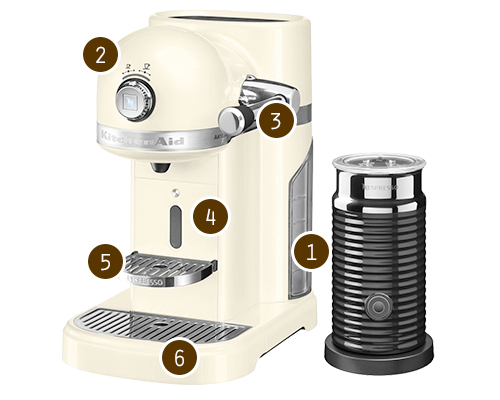 The Aeroccino3 which comes with the KitchenAid coffee machine gives you the benefit of being able to create your favourite milk-based coffee recipes. Equipped with two whisks, you can easily produce the perfect amount of velvety froth for your cappuccino and latte macchiato coffees. All Nespresso coffee machines come with 16 complimentary capsules from the collection of Grand Cru coffees, allowing you to try a range of Nespresso's premium coffee and discover your favourite Grand Cru coffee.